The 12 emails between state prosecutors and Freeh investigators I released today don’t prove a thing. They don’t indicate that Paterno, Spanier, Curley or Schultz are innocent, and they won’t convince the world that anybody that has anything to do with Penn State isn’t scum. What they do suggest, if not confirm, is that the relationship between Freeh investigators and the attorney general’s office was far closer than Freeh ever let on. And I cannot underscore the impact that such a revelation might have on the entire Sandusky narrative. If you’ve read the Freeh report in its entirety, you know this: a former FBI director, who’s a man of supposed impeccable integrity, arrived at damning conclusions based on circumstantial evidence pieced together and presented in a tidy package for the world to consume. The media repeated the gist if his conclusions over and over again – that top Penn State administrators allowed a child predator to harm children for 14 years. But to those of us who read past the first few pages, it just didn’t make sense that Freeh actually believed the rhetoric he was spewing. Until now, I believed the conventional theory: trustees asked Freeh to purposefully skew his findings and blame everything on the dead guy and those that no longer work for Penn State. It allowed the board to “move on,” a mantra that immediately emerged after Freeh concluded his investigation. There still might be some truth to that theory. But the emails, which surprised the heck out of me, offer another, more reasonable, reason for Freeh’s stance. The emails show that Freeh investigators had a clear reverence for state prosecutors, and a devout belief in their mission to convict Sandusky, if not Spanier, Curley and Schultz too. Composed entirely of former law-enforcement officials, it was natural for Freeh’s team to tend to side with prosecutors. For that reason alone, with the benefit of hindsight, it seems obvious that any report would adopt the prosecutors’ stance on what happened at Penn State. There was never a chance that it would be a fair and objective look at how administrators handled the Sandusky allegations 12 years ago. Anything less than total condemnation might have hurt the prosecution’s case against Spanier, Curley and Schultz, and maybe even Sandusky. Former Attorney General Linda Kelly, as well as her prosecution team, needed Freeh’s findings to be strong and damning. Freeh gave them exactly what they needed. It was a big boost to their case. Kelly wasn’t running for re-election, so she didn’t have much riding on the Freeh report’s outcome. But the man who put her there – Tom Corbett – certainly did. Think about how an inconclusive report would have affected Corbett. He would have been harangued for any anti-Penn State statement he ever made. His stance in the early days of the crisis would have dogged him through his re-election campaign next year. And more importantly, as the original attorney general of the Sandusky case, he would have been blamed for bringing charges that could not be independently substantiated, and ultimately held responsible for Penn State’s entire crisis. To be proven right, Corbett more than anybody needed this report to be bad. 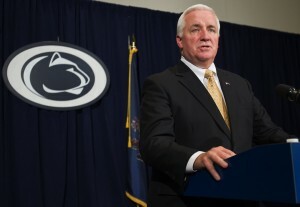 So how would Corbett increase the likelihood that the report would be damning? By ensuring Penn State hired an investigator who would be at least sympathetic to the prosecution’s case, or, at most, even somebody his hand-picked successor could control. The emails suggest that’s exactly what he got when Penn State, at Corbet’s urging, hired Louis J. Freeh. Count me among those who never believed the Corbett conspiracy theories. Until now, I dismissed them as just angry, baseless rhetoric. But these emails raise many other questions that I, and most others, never even fathomed. What did Corbett know when he suggested hiring Freeh? Remember the leaks about the Freeh report just before it was unveiled? Most assumed they came from Penn State. Instead, was the Attorney General’s office actually the sieve? Penn State was Freeh’s client. But it looks like investigators almost became an arm of the prosecution, helping them make their cases against everyone charged. Can they even do that? Did they breach their ethical responsibility? My request for information from the AG’s office essentially was made on Feb. 5 (there’s a long saga involving appeals, but Feb. 5 was the first they they admitted they had to at least look for the records) . Three days later, the supervising judge of the Sandusky grand jury appointed a special prosecutor to investigate secrecy issues surrounding the proceedings. Is the sharing of information with Freeh’s team at the center of that investigation? You have to believe that these 12 emails are just part of what Kane is reviewing. Did trustees know how friendly the Freeh team was with state prosecutors? If they didn’t, are they at both Corbett and Freeh for basically fooling them into thinking they were shelling out cash for an independent investigation. When the NCAA sees these emails, will it admit Freeh’s investigation wasn’t as independent as it originally thought? It’s true that we knew all along Freeh would contact prosecutors to share information. At a press conference announcing his hiring, Freeh said his team would “liaise closely with the law enforcement authorities and ensure that nothing we do interferes with or impedes their important investigations.” But the emails suggest his team not only influenced state prosecutors, but eventually started working on their behalf. Trustee Anthony Lubrano recently suggested that Penn State should get a full refund because Freeh’s investigation didn’t live up to the terms in his contract with Penn State. With the bias shown in these emails, I have to agree with Lubrano. Freeh has some explaining to do. Thanks Ryan for all your efforts. Good luck in the upcoming election. I just heard that the Freeh’s report given to the public actually wasn’t the full report, and that the State Attorney General’s office requested Freeh give the most incriminating pieces to that office, to prosecute. All of these findings were to come out in trial, however, with the Baldwin legal issues that arose and are yet to be ruled on, it may be that these most significant finding are NEVER revealed.